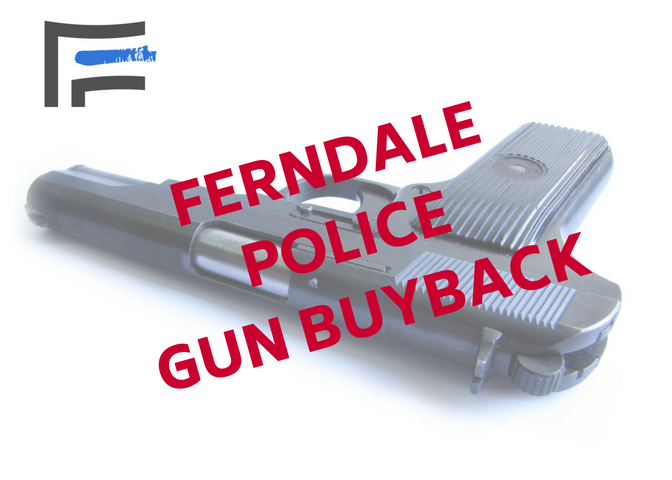 The City of Ferndale Police Department will hold a gun buy-back program as part of “Clean the Ferndale Up”—May 19, 2018, from 9:00 a.m. until 3:00 p.m. The program is open to Ferndale residents as well as non-residents who have a child attending Ferndale Public Schools and reside in Oak Park, Pleasant Ridge, or Royal Oak Township. The focus of the program mirrors the department's efforts to remove unwanted or expired prescription drugs from homes: the prevention of accidental use or misuse as well as the limiting of access to those visitors and family members who might have intentions of appropriating them for their own use. Each working gun is worth $75; non-working guns are worth $50, with a limit of four guns per family. Payment will be made by check within ten to fourteen business days of the date of turn-in. All firearms collected will be checked for lost or stolen status, and if applicable, will be returned to their legal owners. All other firearms will be prepared for destruction. Guns must be transported to the event site in cases, unloaded (no ammunition), in the trunk of a vehicle or as far from the driver as possible (in compliance with state law) and in a safe condition at all times. Guns should be kept in a case or other type of container (duffel bag, paper bag, etc) at all times. Ownership of the firearm is not necessary at the time of the event, but should ownership be questioned payment may be delayed or denied based on additional scrutiny. In all cases, payment for a firearm will be made at the discretion of the Chief of Police. Convicted felons are not eligible to participate in the program, nor will there be blanket immunity granted for violations of any criminal offense, including firearms related laws, while participating in the gun buy-back program. A government-issued identification is required to participate. If you have questions, please contact the Ferndale Police Department non-emergency at 248-541-3650.